Toxoplasma gondii is an obligate intracellular parasite that infects humans and other warm-blooded animals. Previous quantitative proteomic analyses of infected host cells revealed that the expression of many host proteins is modulated by T. gondii infection. 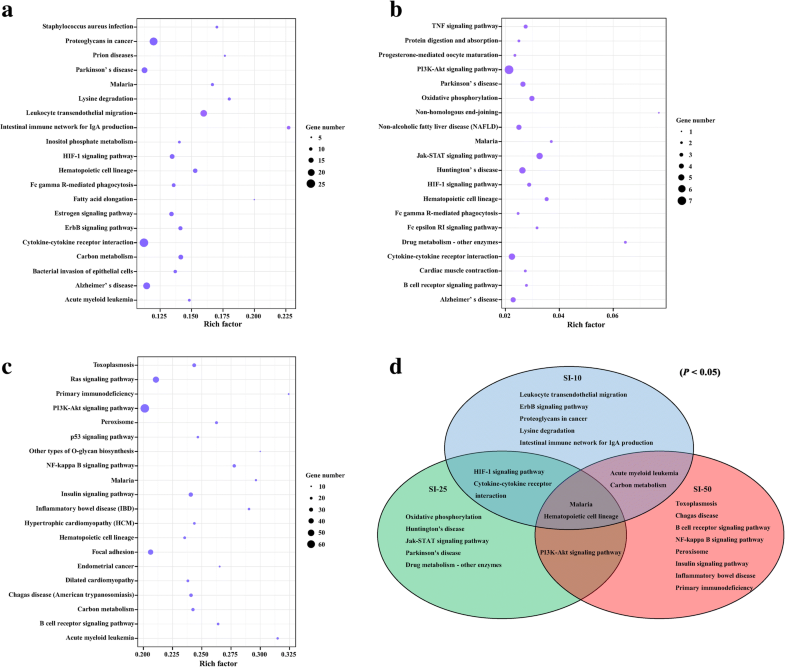 However, at present limited data are available on the differentially expressed miRNAs (DEMs) associated with the pathology and host immune responses induced by acute and chronic infection with T. gondii in pigs in vivo. In this study, high-throughput sequencing was used to investigate expression profiles of spleen miRNAs at 10, 25 and 50 days post-infection (DPI) in pigs infected with Chinese I genotype strain T. gondii isolated from a dead pig. When compared to the control group, 34, 6 and 86 DEMs were found in spleens of infected pigs at 10, 25 and 50 DPI, respectively. Gene Ontology (GO) enrichment analysis of the target genes of DEMs showed that no GO terms were enriched at 25 DPI, whereas 28 and 241 GO terms, of which two and 215 were sample-specific, were significantly enriched at 10 and 50 DPI, respectively. The top 20 Kyoto Encyclopedia of Genes and Genomes (KEGG) pathways of the target genes of DEMs included signal transduction, immune system, metabolism and diseases. miRNA–gene network analysis revealed that the DEMs played important roles in the host immune response to T. gondii infection by modulating expression levels of cellular immunity-related cytokines and immune-related C-type lectins. Our results not only showed that host miRNA expression is altered by T. gondii but also revealed differences in the regulation of key biological processes and pathways involved in host responses to acute versus chronic T. gondii infection. This will aid future research into miRNA-target interactions during T. gondii infection in pigs and the development of novel therapies against T. gondii. Toxoplasmosis, caused by Toxoplasma gondii, is one of the most prevalent parasitic zoonotic diseases in the world. T. gondii infection can cause the acute onset of toxoplasmosis and death in pigs. Ingestion of porcine meat containing persistent tissue cysts is considered to be the major source of T. gondii infection in humans . The distribution of T. gondii genotypes varies worldwide. The Chinese I genotype strain (ToxoDB #9) is predominant in China . RNA silencing through the action of microRNAs (miRNAs) plays a major role in innate antiviral and antibacterial defenses in plants, insects and animals . Initially reported in Caenorhabditis elegans , miRNAs are involved in the regulation of gene expression primarily by binding to the 3′ untranslated regions of target mRNAs, where they repress translation or affect the translation process by inducing mRNA cleavage . A growing body of evidence has demonstrated that parasites promote modifications to host miRNAs, underscoring the importance of miRNAs in parasite-host interactions. After invading host cells, parasites may regulate gene expression in target cells [6–9], including specialized immune cells such as macrophages and dendritic cells (DCs) , to ensure parasite growth and persistence. Microarray analysis has demonstrated that 24 h post-T. gondii infection, over 15% of mRNAs in primary human foreskin fibroblasts display altered abundance relative to uninfected cells . These changes may be explained in part by the differences in host miRNA expression induced by T. gondii infection. Zeiner et al. found that miR-17-92 and miR-106b-25, which are known to play crucial roles in apoptosis and G1/S cell cycle transition pathways, were upregulated by the host in response to T. gondii infection . Similarly, a subset of miRNA genes, including miR-30c-1, miR-125b-2, miR-23b-27b-24-1 and miR-17-92 cluster genes, are transactivated through promoter binding of STAT3 following T. gondii infection in human macrophages . T. gondii develops sophisticated strategies to manipulate hosts for efficient intracellular survival . A recent study showed that different T. gondii strains differed in their ability to induce host immune responses and signaling pathways . For example, only type II strains were found to upregulate expression of miR-146a, a key immune and inflammatory response regulator. In contrast, another study showed that miR-155 was induced by all T. gondii strains assessed . Different T. gondii genotypes may also differ in their ability to alter host miRNA expression levels . Studies of the interactions between the host and the Chinese I genotype strain of T. gondii are currently very limited. Although alterations to host cells harboring T. gondii have been documented at the cellular level, little is known about how the parasite manipulates host cells in vivo. Because the spleen is at the center of humoral and cellular immunity, any functional changes to spleen cells may affect the immune status of the host. Changes in miRNA expression in the spleen following acute T. gondii infection have been reported . However, little is known about the status and functions of the spleen during chronic T. gondii infection . Information on changes in miRNA expression in the porcine spleen after acute and chronic T. gondii infection are also lacking. Therefore, the objective of the present study was to analyze changes in miRNA expression in the porcine spleen after acute and chronic infection with the Chinese I genotype strain of T. gondii using next-generation sequencing technology and bioinformatics analysis. Our results provide novel insights into the role of miRNAs in the response to T. gondii infection in vivo and will further our understanding of the interactions between the host and T. gondii. This will aid future research into the development of novel therapies against T. gondii. All inoculated pigs developed fever beginning 24 h after inoculation with T. gondii and peaking at 3–6 DPI. Fever was accompanied by shivering, anorexia, poor mental state and dyspnea. Three pigs died of T. gondii infection between 8 and 10 DPI. The principle lesions observed were severe edema, hemorrhage and necrosis in parenchymatous organs, including brain, lung, liver, lymph nodes and spleen. Microscopic lesions included hepatocellular degeneration, mononuclear cell infiltration and alveolar type II epithelial cell hyperplasia in the lung, damaged and destroyed splenic corpuscles and lymphocytopenia in the spleen (Fig. 1). No clinical symptoms were observed in pigs 20 DPI. No lesions were observed in pigs 25 or 50 DPI. PCR results showed that all tissues collected at 10 DPI, and brain, lungs and lymph nodes collected at 25 DPI, were T. gondii-positive. However at 50 DPI, only brain tissue was positive for T. gondii by PCR. T. gondii tissue cysts were also found in the brain at this time point by microscopic examination, suggesting that T. gondii had established a chronic infection. No clinical symptoms or lesions were observed in the control group at any point during the study. In the infected group, a total of 13,929,425, 13,143,459 and 11,569,642 raw reads were obtained from SI-10, SI-25 and SI-50 sRNA libraries, respectively. In the control group, 14,250,850, 11,741,170 and 13,207,225 raw reads were obtained from SC-10, SC-25 and SC-50 sRNA libraries, respectively. After removing low-quality reads and masking adaptor sequences, clean reads were obtained from the six sRNA libraries (Table 1). The majority of the sRNAs were 20–24 nt in length. Between 87.41 and 92.74% of sRNA tags from the six libraries were aligned with the pig genome. Sequences of repeats, exons, introns and other non-coding RNAs, including tRNA, rRNA, snRNA and snoRNA, were successfully annotated. A total of 27.64–36.94% of the reads were unique and unique reads were predominantly exon+. Moreover, 0.48–1.73% of the unique reads from each library were identified as known miRNAs and 0.02–0.07% were predicted to be novel miRNAs (Fig. 2). A total of 307 known and 198 novel mature miRNAs, corresponding to 237 and 198 precursors, respectively, were identified with a BLAST search against the miRBase or by recognition of standard stem-loop structures (Table 2). Of these mature miRNAs, 260 known and 25 novel miRNAs were shared amongst the six libraries. Thirteen of the 20 most abundant miRNAs in each sample, including ssc-miR-30a-5p, ssc-miR-143-3p, ssc-let-7a, ssc-miR-26a, ssc-miR-145-5p, ssc-miR-148a-3p, ssc-let-7f, ssc-miR-126-3p, ssc-miR-27b-3p, ssc-miR-21, ssc-let-7i, ssc-let-7 g and ssc-miR-30d were expressed in all six libraries (Additional file 1: Table S1). 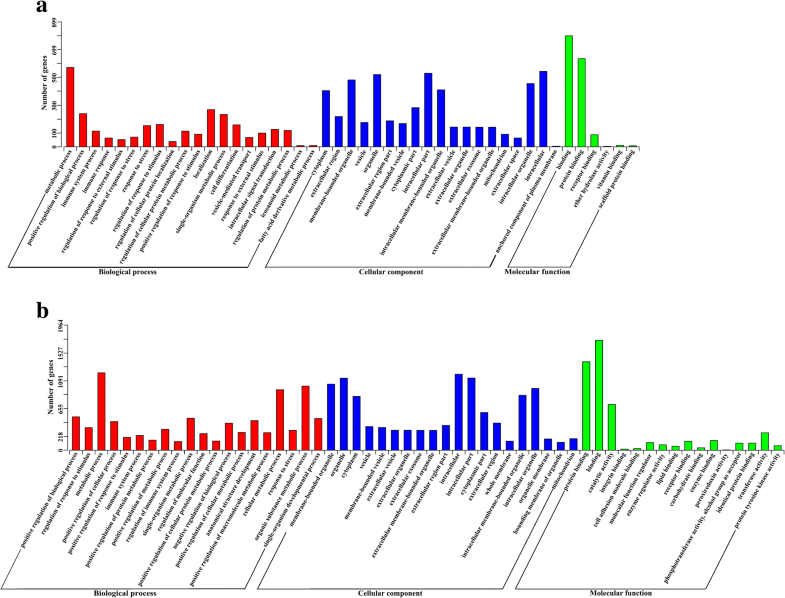 Of the 307 known and 198 novel mature miRNAs, 309 miRNAs were classified into 157 miRNA families. 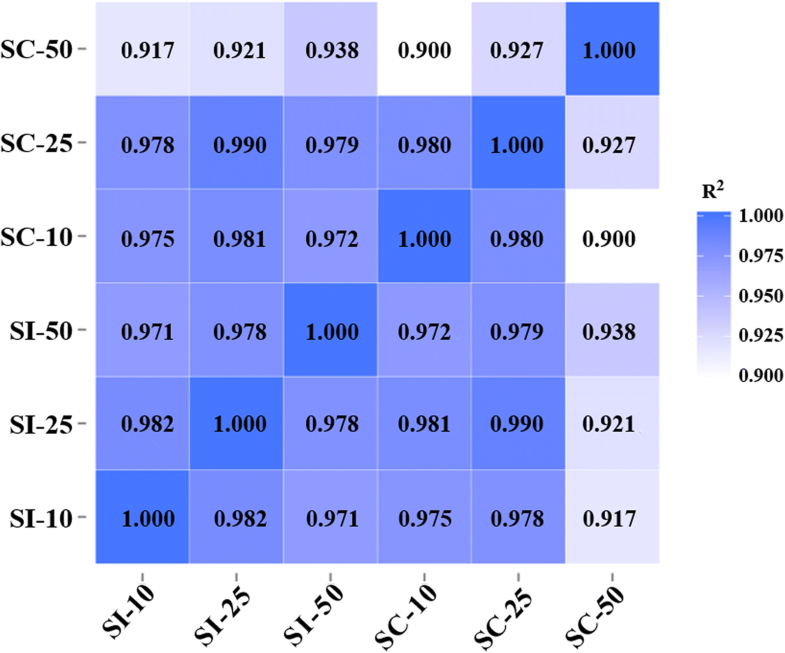 To examine the gene expression patterns of miRNAs in different samples, pearson correlation coefficients were used to estimate expression levels. The correlation coefficients ranged from 0.90 for SC-10 versus SC-50 to 0.99 for SI-25 versus SC-25 (Fig. 3). A total of 109 unique pig-encoded miRNAs were significantly differentially expressed between the infected and control samples at the three time points (q < 0.001), including two novel miRNAs from SI-10 (ssc-novel-154 and ssc-novel-882) and one novel miRNA from SI-50 (ssc-novel-262). 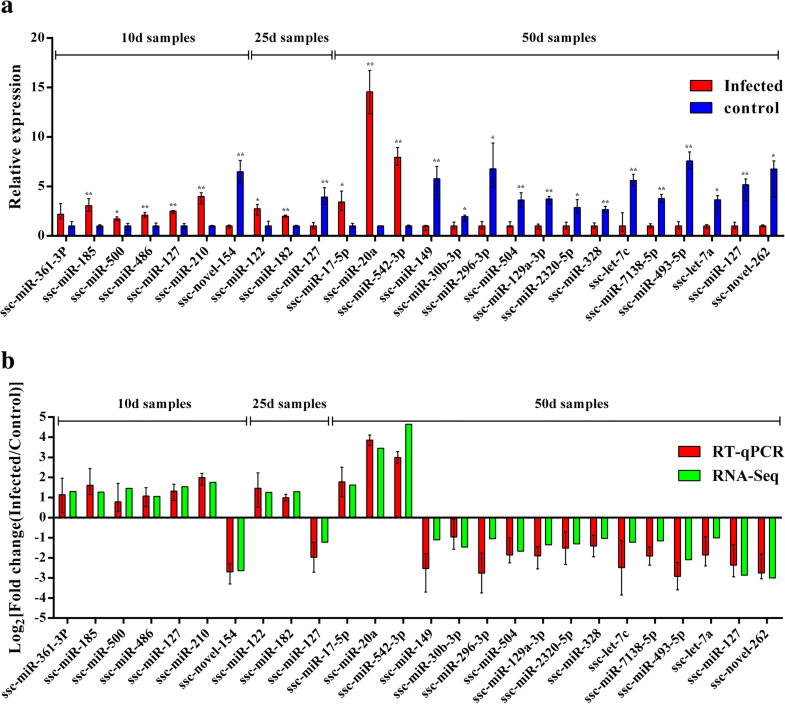 Compared with the control groups at the same time point, 34, 6 and 86 unique miRNAs were identified as DEMs in SI-10, SI-25 and SI-50 samples, respectively (Fig. 4a; Additional files 2, 3 and 4: Tables S2–S4). A total of 115 DEMs were identified to be sample-specific, including 30 from SI-10, 3 from SI-25 and 82 from SI-50. Of the 69 upregulated DEMs, one (ssc-miR-144) was found in all infected samples. None of the 57 downregulated DEMs were common to all infected samples (Fig. 4b). Candidate target genes of DEMs were predicted using RNAhybrid and miRanda softwares. At 10, 25 and 50 DPI, 838, 25 and 722 target genes were predicted for the upregulated miRNAs and 325, 85 and 2008 target genes were predicted for the downregulated miRNAs, respectively. To better understand the functions of the DEMs, we performed GO and KEGG pathway analysis on these putative target genes. The GO assignments of target genes are shown in Fig. 5. Compared with control samples at the same time points, a total of 28, 0 and 241 significantly enriched GO terms (P < 0.01) were identified from SI-10, SI-25 and SI-50 samples, respectively. Of 269 GO terms, 26 were shared between SI-10 and SI-50 samples, most of which were related to cell differentiation, immune responses, localization, metabolic processes, responses to stress and binding. The GO terms receptor binding (GO: 0005102) and vesicle-mediated transport (GO: 0016192), were only found in the SI-10 sample, whereas 215 GO terms, involved to intracellular transport and signal transduction, apoptotic processes, hydrolase activity, metabolic processes and regulation of immune responses, were significantly enriched in the SI-50 sample. KEGG pathways with P values < 0.05 were analyzed. A total of 255, 121 and 267 KEGG pathways were obtained at 10, 25 and 50 DPI, respectively (Additional file 5: Table S5). The top 20 KEGG pathways of the target genes of DEMs are shown in Fig. 6a, b and c. The most frequently represented pathways were associated with signal transduction, immune system, metabolism (overview, amino acid, energy), and diseases (infectious diseases, cancers, neurodegenerative diseases and immune diseases). KEGG pathway enrichment analysis revealed that 11, 10 and 13 pathways were significantly enriched (P < 0.05) at 10, 25 and 50 DPI, respectively. The Venn diagram of enriched pathways at the three time points is shown in Fig. 6d. The pathways “Leukocyte transendothelial migration” (ssc04670) and “Intestinal immune network for IgA production” (ssc04672) were found only at SI-10, whereas more immune-related pathways, including “B cell receptor (BCR) signaling” (ssc04662), “Inflammatory bowel disease” (ssc05321), “NF-kappa B signaling” (ssc04064) and “Primary immunodeficiency” (ssc05340) pathways were found only at SI-50. The pathways “Malaria” (ssc05144) and “Hematopoietic cell lineage” (ssc04640) were common to all three time points, indicating that both pathways play important regulatory roles during T. gondii infection. Regulatory networks were constructed for the immune-related target genes and DEMs at 10, 25 and 50 DPI (Fig. 7). At 10 DPI, 33 different cytokines, including chemokines, interleukins (ILs), tumor necrosis factors (TNF) and interferons (IFN), were potentially regulated by 17 DEMs. Among these DEMs, ssc-miR-361-3p and ssc-miR-423-5p regulated the greatest number of target genes, with five targets each. The target gene regulated by the greatest number of DEMs was IL17RC, with four miRNAs, followed by TNFSF9 and IL17RA, each regulated by two DEMs (Fig. 7a). These results indicate that these DEMs and cytokines might play important roles in the host response to acute T. gondii infection. At 25 DPI, one miRNA, ssc-miR-127, was found to regulate the expression of three cytokine genes, TNFRSF19, IL15 and colony stimulating factor 3 (CSF3) (Fig. 7b). At 50 DPI, 56 different cytokines were found to be regulated by 26 DEMs. Of these, ssc-miR-2320-5p had the greatest number of target genes, with 15 targets, followed by the miRNAs ssc-miR-328, ssc-miR-296-3p, ssc-miR-339-5p and ssc-miR-4334-3p, which each had eight targets. The target gene regulated by the greatest number of DEMs was CCR7, with four miRNAs. Nine other target genes were each regulated by three DEMs (Fig. 7c). These cytokines may play key roles in the interaction between host cells and T. gondii during chronic infections. Many genes encoding C-type lectins were also found to be targets of host miRNAs induced by T. gondii. The interaction networks between these C-type lectins and the identified miRNAs were established at the different time points. At 10 DPI, nine candidates containing C-type lectin domains were found to be regulated by seven DEMs. The miRNAs ssc-miR-185 and ssc-miR-423-5p were shown to regulate the greatest number of target genes, with two targets each (Fig. 7d). At 50 DPI, a total of 22 C-type lectins were regulated by 20 DEMs. The ssc-miR-2320-5p was determined to have the greatest number of target genes, with six targets), followed by ssc-miR-296-3p, which had five targets. Of the 22 C-type lectin genes, CD72 and MRC2 were regulated by the greatest number of DEMs, with five miRNAs each (Fig. 7e). Twenty-six representative DEMs, including a miRNA (ssc-miR-127) with different expression patterns at the three time points, were validated with quantitative reverse transcription real-time PCR (RT-qPCR). miRNA sequences in which uracil was replaced by thymine were used as the forward primers for the real-time PCR described in Table 3. With the exception of ssc-miR-182, ssc-miR-542-5p and ssc-novel-154, the miRNAs assessed with RT-qPCR were identified as having roles in the regulation of protein expression in the specific signaling pathways or miRNA–gene network analysis performed in this study. For example, ssc-miR-122 and ssc-miR-127 were associated with the host inflammatory response; ssc-miR-361-3p, ssc-miR-500, ssc-miR-486 and ssc-miR-185 were involved in immune cell differentiation; ssc-miR-328, ssc-let-7c, ssc-miR-493-5p, ssc-let-7a and ssc-miR-7138-5p were related to B cell ontogeny and production of protective antibodies; ssc-miR-30b-3p, ssc-miR-504, ssc-miR-149, ssc-miR-296-3p, ssc-miR-129a-3p and ssc-miR-2320-5p were found to be involved in host protective responses and parasite growth. With the exception of that of ssc-miR-361-3p, the expression patterns of miRNAs measured with RT-qPCR corresponded with those obtained by high-throughput sequencing (Fig. 8), confirming the accuracy and reliability of sequencing results used for functional analyses. T. gondii infection is mainly acquired by ingestion of food or water that is contaminated with oocysts shed by cats or by eating undercooked or raw meat containing tissue cysts. Under natural infection conditions, sporozoits and bradyzoites enter all nucleated cells including enterocytes by active penetration and form a cytoplasmic vacuole. After repeated replication, host cells are disrupted and tachyzoites are disseminated via the bloodstream and infect many tissues including spleen . So the intestinal mucosa is the first protective barrier of the host. It has been observed that the enterocytes invaded by T. gondii can induce the activation of lymphocytes, monocytes, macrophages and dendritic cells in the lamina propria of intestinal mucosa to resist and eliminate the parasites [21, 22]. In our original experimental design, we planned to infect pigs with T. gondii oocysts. But unfortunately, no T. gondii oocysts were found from cats infected with T. gondii YZ-1 strain. And due to mouse-virulent of T. gondii YZ-1 strain, no tissue cysts were obtained from mice infected with tachyzoites . Therefore, the pigs in this study were infected intravenously with T. gondii tachyzoites. Compared to natural infection, T. gondii tachyzoites could directly reach the spleen with blood flow, invade spleen cells, and rapidly induce immune responses of the host. And thus, some miRNAs from pig infected intravenously with T. gondii tachyzoites would probably be omitted. In this study, 109 DEMs were identified in porcine spleen samples at three time points after T. gondii infection. Of these, 86 DEMs were found at 50 DPI. This result is consistent with previous studies in mice that found that more miRNAs were differentially expressed at 21 DPI than at 14 DPI  and that chronic infection induced a greater number of differentially expressed genes . Some DEMs, including miR-21, miR-142-3p, miR-101, miR-184, miR-182, miR-155, miR-181a, miR-146, miR-126, miR-29, miR-17 and miR-19, are known to be involved in the host immune response [26, 27]. For example, it has been reported that the downregulation of miR-184 and miR-16, which were downregulated at 10 DPI in the present study, prevents hyperactivation of T cells and macrophages . Deficiency in miR-146, similar to miR-146b, which was upregulated at 10 and 25 DPI in this study, in regulatory T cells results in dysregulation of IFN-γ responses. The upregulation of miR-182, which we observed at 25 DPI, has been associated with the expansion of T helper cells . miR-181d and miR-155, which were downregulated at 50 DPI in this study, are known to be involved in T cell development and differentiation, whereas miR-17 upregulation has been associated with B cell generation . miR-21, which we found was upregulated at 50 DPI, acts as a negative regulator of toll-like receptor (TLR) 4 and inhibits the expression of pro-inflammatory cytokines . miR-126, which was upregulated at 50 DPI in our study, is a potent and specific activator of T helper 2-regulated allergic inflammatory responses . Depletion of miR-146a, downregulated at 50 DPI in the present study, has been implicated in hyperactive responses to infection . These reports indicate that the DEMs induced by acute T. gondii infection in our study are mainly related to the activation of immune cells, whereas those induced by chronic infection are mainly involved in the inhibition of inflammatory response. Furthermore, some of the DEMs identified in this study have also been found in mice and cats infected with T. gondii. In the murine model, miR-155-5p and miR-146a were upregulated within 48 h of infection with type II strain . However, in the present study the expression levels of both of these miRNAs did not differ during acute infection and were downregulated during chronic infection. 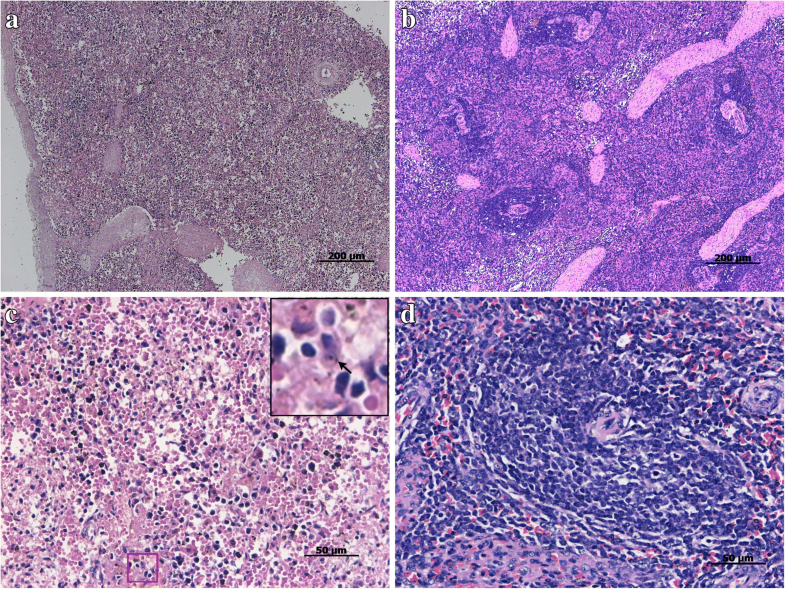 A large number of the DEM homologs identified in this study have also been found in the livers of domestic cats following acute T. gondii infection  and the expression patterns of several homologs, including miR-361-3p, miR-151-3p and miR-30b-5p, in the acute phase were consistent with previous reports, indicating that these miRNAs are induced in by T. gondii infection in different hosts and have important roles during acute infection. In KEGG enrichment analysis of the target genes in this study, two enriched pathways, malaria and hematopoietic cell lineage, were identified at 10, 25 and 50 DPI (Fig. 6d). The malaria pathway includes processes involved in the invasion of hepatocytes by malaria sporozoites, subsequent infection of red blood cells by merozoites and the eventual activation of the host immune response. Therefore, our results support the findings of a previous study that found that the process of host cell invasion is very similar between T. gondii and Plasmodium . The hematopoietic cell lineage pathway includes processes involved in stem cells differentiation into several different cell types [36, 37]. In the present study, at 10 DPI the target genes belonging to the hematopoietic cell lineage pathway were mainly related to the regulation of initial T cell differentiation and to myeloid-related DC and macrophage generation (Additional files 6 and 7: Figure S1, Table S6). Inhibition of the process of host T cell differentiation by the miRNAs ssc-miR-361-3p, ssc-miR-500, ssc-miR-486 and ssc-miR-185 (Additional file 2: Table S2; Fig. 8) may downregulate host immune responses, which may inhibit damage caused by excessive immunity and create an immune environment that is conducive to the survival of parasites. At 25 DPI, erythropoietin (EPO) and CSF3, target genes belonging to the hematopoietic cell lineage pathway, were regulated by ssc-miR-122 and ssc-miR-127, respectively (Additional file 3: Table S3; Fig. 8). EPO has been found to regulate erythrocyte production and cytokine formation  and CSF3 has been associated with neutrophil production. Thus, the host inflammatory response could be regulated by altering EPO and CSF3 expression. At 50 DPI, we identified 23 DEMs associated with target genes involved in the differentiation of several different immune cell types. For example, the downregulation of ssc-miR-328, ssc-miR-2320-5p and ssc-miR-30b-3p (Additional file 4: Table S4; Fig. 8) may induce B cell proliferation in the spleen, resulting in the production of protective antibodies against chronic T. gondii infection (Additional files 6 and 7: Figure S1, Table S6). Infection stage-specific pathways were found at three time points after T. gondii infection. At 10 DPI, leukocyte transendothelial migration (ssc04670), intestinal immune network for IgA production (ssc04672), proteoglycans in cancer (ssc05205), ErbB signaling (ssc04012) and acute myeloid leukemia (ssc05221) pathways were enriched. ssc04670 and ssc04670 are immune-related pathways, whereas ssc05205, ssc04012 and ssc05221 are cancer-related pathways that were also found to be enriched in the spleens of mice affected by acute T. gondii infection . The enrichment of these pathways suggests that the host immune system and cancer processes are activated by T. gondii infection. At 25 DPI, two neurodegenerative disease pathways, Huntington’s disease (ssc05016) and Parkinson’s disease (ssc05012), were enriched (Fig. 7), suggesting that the host’s central nervous system is damaged when parasites invade host brain cells. A recent study in mice showed that T. gondii loads in the brain increased until 21 DPI and persisted at high levels throughout the infection . More stage-specific pathways were found to be enriched at 50 DPI than at 10 and 25 DPI. Chagas disease (ssc05142) and toxoplasmosis (ssc05145) were two enriched pathways related to protozoan disease. The DEMs in the toxoplasmosis pathway were mainly involved in the regulation of the expression of genes related to anti-inflammatory responses and cell survival, whereas the DEMs in the Chagas disease pathway were mainly involved in the apoptosis of infected cells and the intracellular persistence of parasites. The downregulation of miRNAs in the Chagas disease pathway, including ssc-miR-30b-3p, ssc-miR-504, ssc-miR-149, ssc-miR-296-3p, ssc-miR-129a-3p and ssc-miR-2320-5p (Additional file 4: Table S4; Fig. 8), may contribute to the inhibition of host protective responses and the promotion of parasite growth (Additional files 8 and 9: Figure S2, Table S7), indicating that these miRNAs may be associated with parasite immune evasion mechanisms. The BCR signaling pathway (ssc04662), which is mainly involved in B cell ontogeny and immunoglobulin production, was another important stage-specific pathway enriched at 50 DPI. Nine miRNAs involved in this pathway, including ssc-miR-149, ssc-miR-328, ssc-let-7c, ssc-miR-493-5p, ssc-let-7a, ssc-miR-30b-3p, ssc-miR-2320-5p, ssc-miR-504 and ssc-miR-7138-5p, were identified in this study (Additional file 4: Table S4; Fig. 8). 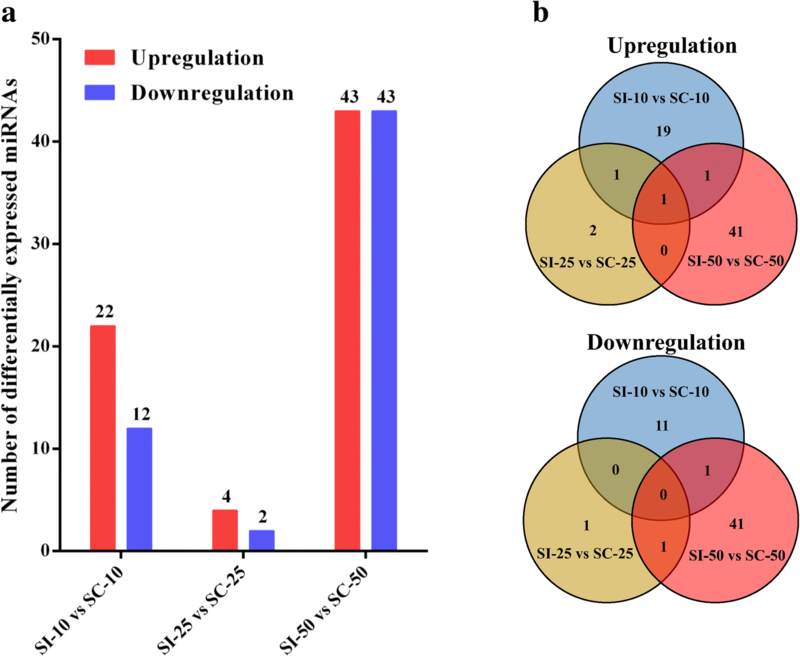 ssc-miR-149 downregulation may directly promote immune responses by regulating C-JUN expression (Additional files 10 and 11: Figure S3, Table S8). Abnormal B cell signaling has been linked to various diseases, including lupus, lymphoma and other immune disorders , suggesting that abnormalities in the BCR signaling pathway induced by miRNAs may contribute to the pathogenesis associated with chronic toxoplasmosis infection. 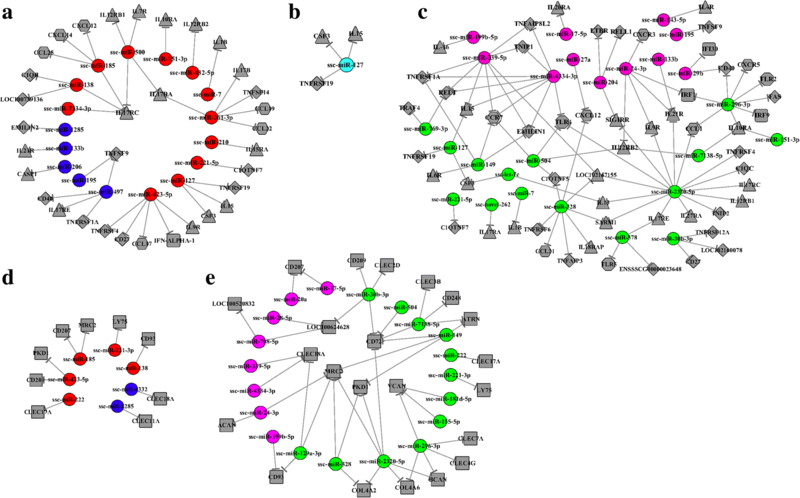 Analysis of miRNA–gene networks between immune-related target genes and DEMs revealed that target genes encoding TNFRSF4, C1QTNF7, CD27, IL1B, IL10RA, IL12RB1, IL17RA, IL17RC, CSF3 and TNFSF9 were all upregulated in SI-10 samples and downregulated in SI-50 samples, with the exception of TNFSF9 (downregulated in SI-10 samples and upregulated in SI-50 samples) (Fig. 7a and c). TNFRSF4 (OX40, CD134) and its binding partner are members of the TNFR/TNF superfamily and are involved in the control of inflammatory diseases and cancer . CD27, a member of the TNF-receptor superfamily, is required for the maturation of conventional natural killer (NK) cells and the generation and long-term maintenance of T cell immunity and plays a key role in regulating B cell activation and immunoglobulin synthesis [42, 43]. IL-1β, IL-12, IL-17 and their receptors have also been shown to be important mediators of the inflammatory response [44–46] and play key roles in host immune responses induced by T. gondii infection . Inhibition of IL-12 production is an important part of the immune evasion mechanism of T. gondii . TNFSF9 was confirmed to play important roles during NK and B cell activation [49, 50]. Therefore, the differences in the expression patterns of cytokines regulated by miRNAs that we observed at 10 and 50 DPI may be due to differences in the host immune responses induced by acute and chronic T. gondii infections. Interestingly, only three cytokines were found to be involved in host immune regulation at 25 DPI (Fig. 7b). This seems to suggest that this time point may be a special phase of T. gondii infection. C-type lectins, membrane-related receptors involved in the presentation of antigens, have been found to play important roles in Trypanosoma cruzi, Leishmania and Neospora caninum infections [51, 52]. In the present study, we found that a number of C-type lectins were regulated by miRNAs in SI-10 and SI-50 samples. Analysis of miRNA-gene networks between C-type lectins and DEMs showed that genes encoding CD209 (DC-SIGN), PKD1, CLEC17A and lymphocyte antigen 75 (LY75) were upregulated in SI-10 samples but were downregulated in SI-50 samples (Fig. 7d and e). Previous research has reported that the expression of CD209 on macrophages activates phagocytosis, mediates DC rolling interactions with endothelium, activates CD4+ T cells and initiates innate immunity by modulating TLRs [53, 54]. LY75 expressed on CD8+ DCs plays a role in antigen processing and presentation in the context of both MHC class I and class II molecules and generates T helper 1-mediated immune responses through an IL-12-independent and CD70-dependent mechanism . The roles of those C-type lectins need to be confirmed in T. gondii infection. However, C-type lectins regulated by miRNAs clearly play important roles in both acute and chronic T. gondii infection in vivo. To our knowledge, this is the first report on miRNA expression profiles in the spleens of pig infected with T. gondii. A total of 109 DEMs, many of which are known to be involved in the host immune response, were found in pig spleens following T. gondii infection. Compared to 10 DPI (34 DEMs) and 25 DPI (6 DEMs), more differences in the expression of host miRNAs were found between the infected and control groups at 50 DPI (86 DEMs). GO and KEGG enrichment analyses suggested that T. gondii infection may modulate different host biological processes through DEMs. miRNA–gene network analysis revealed differences in the host immune response to acute and chronic T. gondii infection. This study provides a foundation for research on miRNA-target interactions during T. gondii infection in pigs. Furthermore, the findings of this study will contribute to the elucidation of the mechanisms responsible for susceptibility and to spleen pathophysiology of infection in other organisms, including humans. A YZ-1 strain of T. gondii, obtained from a home-bred wild boar in Jiangsu Province, China in 2011, was cryopreserved in liquid nitrogen in our laboratory. The strain was confirmed to be ToxoDB PCR-RFLP genotype #9 (Chinese I) and shown to be virulent in mice in our previous study . Twenty-four 5-week-old commercial pigs were provided by the Jiangsu Meilin Animal Husbandry Co., Ltd. (Jiangsu, China), and proven to be free from T. gondii, classical swine fever virus, porcine reproductive and respiratory syndrome virus, porcine pseudorabies virus, porcine parvovirus and porcine circovirus virus by specific IgM and IgG antibody tests using ELISA and the whole blood nucleic acid detection using PCR methods. All pigs were housed individually in standard breeding houses for 1 week prior to infection. All pigs were fed the same commercial food. Pigs were randomly divided into the control group (9 pigs) or the infection group (15 pigs). Each pig in the infection group was intravenously injected with 5 × 107 T. gondii tachyzoites. Pigs in the control group were injected with phosphate buffered saline (PBS) instead of tachyzoites. In addition, five ICR mice purchased from the Comparative Medicine Center of Yangzhou University (Yangzhou, China) were inoculated intraperitoneally with 200 tachyzoites to assess T. gondii viability. After infection, clinical symptoms were observed and rectal temperatures were measured twice daily. At 10, 25 and 50 days post-infection (DPI), three pigs from each group were sacrificed under deep anesthesia with sodium pentobarbital (200 mg/kg body weight) by captive bolt for small animals. The brain, liver, spleen, lungs and lymph nodes of pigs were collected for histopathological observation and for T. gondii detection using two PCR methods targeting the 529-bp repetitive sequence (AF146527) and B1 gene (AF179871) as previously described [56, 57], respectively. Each reaction comprised 1 × PCR Buffer (100 mM Tris-HCl, pH 8.3, 500 mM KCl, 15 mM MgCl2), 0.2 mM dNTP, 0.4 μM of each primer, 0.5 U of Taq DNA polymerase, and 2 μL of template to a total volume of 50 μL. The conditions for amplification were as follows: 95 °C for 4 min, 35 cycles of 94 °C for 30 s, 58 °C (60 °C for B1 gene) for 40 s, and 72 °C for 1 min, and a final step of 72 °C for 10 min. The genomic DNA of the YZ-1 strain was set as the positive control, whereas the tissue DNA of a pig, confirmed T. gondii infection-free by PCR, was the negative control for each reaction. Spleens collected from pigs were thoroughly rinsed in PBS and immediately frozen in liquid nitrogen. The spleen samples were then stored at − 80 °C until RNA extraction. Total RNA was prepared from individual spleen samples using TRIzol Reagent (Invitrogen, Carlsbad, CA, USA) according to the manufacturer’s protocol. The quality and quantity of RNA samples were assessed using an Agilent 2100 Bioanalyzer (Agilent Technologies, Santa Clara, CA, USA) and a Nanodrop 2000 (Thermo Scientific, Wilmington, MA, USA), respectively. Three individual RNA samples with high RNA integrity values from each group at each of the time points were equally pooled. A total of 3 μg total pooled RNA was used as input material for the small RNA (sRNA) libraries. Thus, a total of six sRNA libraries were generated, including SI-10, SI-25 and SI-50 from samples collected from the infection group at 10, 25 and 50 DPI, respectively, and SC-10, SC-25 and SC-50 from samples collected from the control group at 10, 25 and 50 DPI, respectively. Libraries were generated using NEBNext® Multiplex Small RNA Library Prep Set for Illumina® (NEB, Ipswich, MA, USA) following the manufacturer’s recommendations and sequenced at the Novogene Bioinformatics Institute (Beijing, China) on an Illumina Hiseq 2500 platform (Illumina, San Diego, CA, USA) following the vendor’s instructions. After sequencing, raw reads were processed using custom PERL and Python scripts. The sequencing error rate of each base was evaluated using the Phred score . Clean reads were obtained by removing reads containing poly-N, reads with 5′ adapter contaminants, reads without the 3′ adapter or insert tags, reads containing poly A, T, G or C and low-quality reads from raw data. In addition, reads shorter than 18 nt or longer than 35 nt were discarded. All filtered sRNA tags were aligned onto the pig genome with Sscrofa 10.2 from Ensembl (http://www.ensembl.org/Sus_scrofa/Info/Index) using Bowtie without mismatch to analyze their expression and distribution . To remove tags originating from protein-coding genes, repeat sequences, rRNA, tRNA, snRNA and small nucleolar RNA (snoRNA), sRNA tags were mapped to RepeatMasker (http://www.repeatmasker.org/), the Rfam database (http://rfam.xfam.org/). Known porcine miRNAs were then identified from the mapped sRNA tags using miRBase 20.0 (http://www.mirbase.org/). miREvo  and miRDeep 2  were used to predict novel miRNAs by examining secondary structures. Custom scripts were also used to obtain the miRNA counts and the base bias on the first position of identified miRNAs of certain lengths and on each position of all identified miRNAs. In addition, miRNAs that might have base edits were detected by aligning all the sRNA tags to mature miRNA sequences, allowing a maximum of one mismatch. Furthermore, an exact match to highly conserved seed regions (positions 2–7 of the mature miRNA)  was used to classify different miRNA families. And families of mapped miRNAs were identified from other species using Rfam (http://rfam.xfam.org/search). Full details of the sequence data were submitted to the Gene Expression Omnibus (GEO) public database (http://www.ncbi.nlm.nih.gov/geo/) with the GEO accession number GSE113130. The raw data are available in the NCBI Sequence Read Archive under the accession number PRJNA450089. miRNA expression levels were estimated by the number of transcripts per million clean tags (TPM) . Differential expression analysis between groups was performed using the R package DEGseq (2010). P values were adjusted using q values . The q value < 0.01 and |log2(fold change)| > 1 were set as the threshold values for differential expression. To understand the cellular functions of DEMs and to identify their associated molecular pathways, target genes of DEMs were predicted using miRanda  and RNAhybrid . GO (http://www.geneontology.org/) enrichment analysis of DEMs was performed using the R package GOseq with a gene length bias correction . GO terms with a P value < 0.01 were considered significantly enriched with DEMs. Additionally, pathway analysis was used to classify DEMs into significantly enriched pathways (P < 0.05) according to KEGG (http://www.genome.jp/kegg/). We used KOBAS software for statistical tests of the enrichment of DEMs in KEGG pathways . In addition, some DEMs-regulated pathways were analyzed by the KEGG map annotations [68, 69]. To gain insight into the interactions between miRNAs and target genes related to the immune response against T. gondii and to study the relationships between DEMs at different time points, miRNA-gene networks were created and visualized using Cytoscape 3.4.0 software . To verify sequencing results, 26 DEMs, including 24 known and two novel miRNAs, were selected and measured using SYBR green-based RT-qPCR. miRNA sequences and primers were synthesized by BGI Co. Ltd. (Shenzhen, China). Total RNA extracted from spleen samples was reverse transcribed into cDNA using a Mir-x™ miRNA First-Strand Synthesis and SYBR® RT-qPCR Kit (TaKaRa, Dalian, China) following the manufacturer’s instruction. Primers were used at 10 μM each to amplify target miRNAs in a 20 μl reaction mixture. RT-qPCR cycling conditions were as follows: 95 °C for 5 min; followed by 40 cycles of 95 °C for 5 s, 60 °C for 10 s, and 72 °C for 15 s; and melting curve analysis from 60 °C to 95 °C. Three replicates were included for all reactions. Primers provided by the kit were used to amplify the snRNA U6 as a housekeeping miRNA to normalize miRNA expression. The expression of each miRNA relative to U6 was calculated using the 2−ΔΔCT method as described previously . Zhaofeng Hou and Dandan Liu contributed equally to this work. We acknowledge support by Dr. Xiao-Bo Wang from the College of Veterinary Medicine, Yangzhou University (Yangzhou, China) for the help in the preparation of the pathological sections of this study. This study was supported by the funding from the Open Project Program of Jiangsu Key Laboratory of Zoonosis (R1507), A Project Funded by the Priority Academic Program Development of Jiangsu Higher Education Institutions (PAPD) and the University Graduate Scientific Research Innovation Program of Jiangsu Province (CXLX_1431). The funders had no role in study design, data collection and analysis, decision to publish, or preparation of the manuscript. The datasets supporting the findings of this article are included within the article. Full details of the sequence data were submitted to GEO public database (http://www.ncbi.nlm.nih.gov/geo/) with the accession number GSE113130. The raw data are available in the the National Center for Biotechnology Information (NCBI) Sequence Read Archive under the accession number PRJNA450089. JT and ZH conceived and designed the experiments, and wrote the manuscript. ZH, DL, SS, LW, CJ, ZZ, YM and QL performed the experiments. ZH, DL, SS and JX performed the data analysis. All authors read and approved the final manuscript. The study was approved by the Animal Care and Use Committee of the College of Veterinary Medicine, Yangzhou University (Approval ID: SYXK [Su] 2012–0029). Animal care and procedures were handled strictly according to the Animal Ethics Procedures and Guidelines of the People’s Republic of China. Humane endpoints were used in animal experiments, and animals were sacrificed under deep anesthesia with sodium pentobarbital (200 mg/kg body weight) when necessary. All efforts were made to minimize animal suffering.